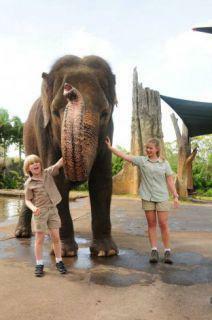 ...Growing Up Wild, starring the children of the late adventurer Steve Irwin, Robert Irwin, 8, and Bindi Irwin, 13. In each episode the children take a walk about their 'yard,' the 1,500 acre Australia Zoo, near Brisbane, visiting exotic animals as if they were living in their own backyard! Robert wants everyone to learn that "Not all animals actually make good pets. Be careful what animals you actually choose and always protect animals." Bindi says she hopes the show generates interest in conservation because "Every time we lose an animal species, it's like losing a brick from the house. Pretty soon, the house just falls over." Master And Pet, a comedy about a cat who is her mistress's best friend, co-conspirator, and therapist! Then there's Kitten on a Keyboard, a cat-directed comedy featuring Anime Lillipuss who greets viewers and treats them to all sorts of silly pet stuff; Pet Sense, in which animal communicator Michelle Childerley speaks to American pets and parents to encourage mutual cooperation to get their relationships on track; and David Lehre's Hollywood Animals, in which David Lehre drops in on his celebrity friends to find out about their relationships with their pets. You can see episodes of these shows now, but there's a lot more to come. Visit The Pet Collective channel on You Tube.